How cold is -40 degrees Celsius; and -40 degrees Fahrenheit? They are both as cold as each other. Surprised, and intrigued, having never thought about it before, I decided to reflect on it. After a while, I realised that the fact that the formula for converting between Celsius and Fahrenheit is linear (multiply by nine firths, add thirty two) is exactly in the same format as y=ax+b, and so I drew the following graph. 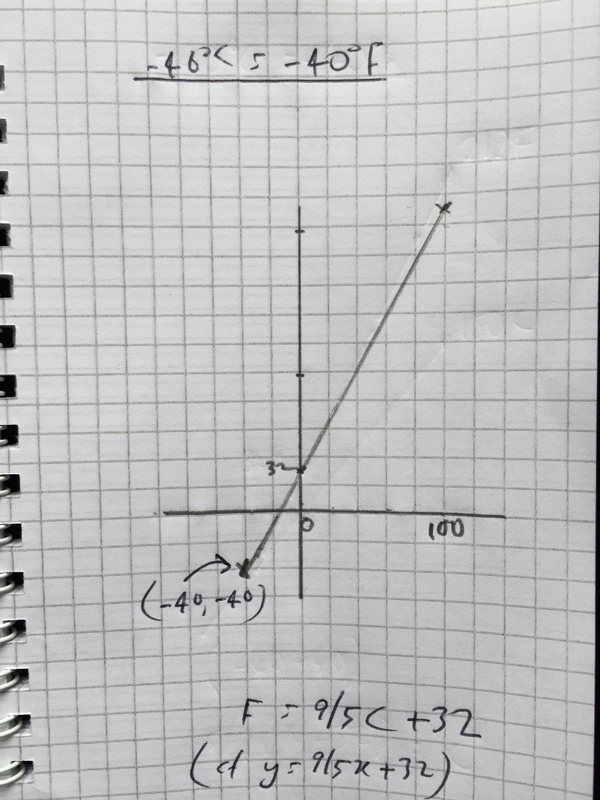 The representation of Celsius on the above graph is y=x, the line which goes through both (0,0) and (-40, -40). QED. Interested, as a result, in temperatures, a quick google found that Gabriel Fahrenheit, a seventeenth century scientist, chose his 0 degrees to be the freezing point of a particular salt and water mix; and 96 degrees to be the temperature under an arm-pit/in a mouth…from which extrapolating 212 degrees was the boiling point of water, and, interpolating, 32 degrees its freezing point. Quite sensible, really, to have something as useful as body temperature to help define a scale.